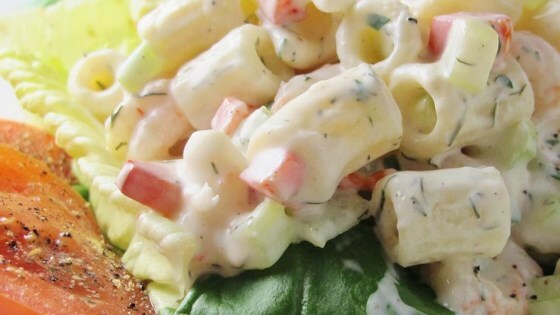 "Light and lemony, this recipe is a change from standard macaroni salads." Bring a large pot of lightly salted water to a boil. Cook ditalini pasta in the boiling water, stirring frequently, until cooked through but firm to the bite, about 8 minutes. Drain and rinse pasta under cold water. Combine pasta, mayonnaise, celery, green onions, red bell pepper, lemon juice, chopped parsley, salt, and pepper in a large bowl until macaroni salad is well combined. Set a few egg slices aside for garnish and stir remaining egg slices into macaroni salad. Cover bowl with plastic wrap and refrigerate, 8 hours to overnight. Stir shrimp into macaroni salad, adding more mayonnaise if salad is dry. Garnish salad with reserved egg slices and parsley sprigs. I didn't like this as much as I thought I would. To me, the lemon juice was overpowering and made the salad too sour. Disappointed. I made it and it was great, added imitation crab, left out the celery because of allergies and I forgot the boiled eggs... But still turned out awesome.